2018년 오드 스쿨 컬렉션은 기존 홀리데이 컬렉션이 항상 유지했던 ‘반짝이는 펄‘이라는 지루한 공식을 탈피하고 에스쁘아의 새로운 레트로 감성을 담았습니다. ‘ODD SKOOL’이라는 컬렉션 명과 묘하게 연상되는 단어 ‘SCHOOL’에서 필기구 콘셉트를 가져왔으며 간편하게 집어갈 수 있는 제품으로 밀레니얼 세대의 감성을 자극하고자 했습니다. 이번 컬렉션의 메인 제품인 노웨어 오드 펜슬은 우드 타입 크레용에 골드 포인트를 줘서 빈티지 무드를 완성했으며 패키지 또한 빈티지 필기구 느낌이 나도록 디자인하였습니다. 일반적이고 단순한 네모 단상자를 탈피하고 끈이나 삼각형 지기 구조를 활용해 차별화된 패키지와 재미요소를 주었습니다. 또한 겨울 느낌의 톤 다운된 컬러와 보색 대비를 통해 ‘오드’ 함을 강조하고자 하였습니다. 판촉으로 진행된 퍼 재질의 파우치 또한 오묘한 컬러 대비와 골드 포인트로 오드 스쿨의 제품의 매력도를 올렸습니다. 지루함을 거부하는 에스쁘아만의 4.8차원 오드 스쿨의세계로 들어와 보세요! The 2018 Holiday Collection by Odd Skool captures new retro-style sensibility rather than the predictable, all-too-common glitters. 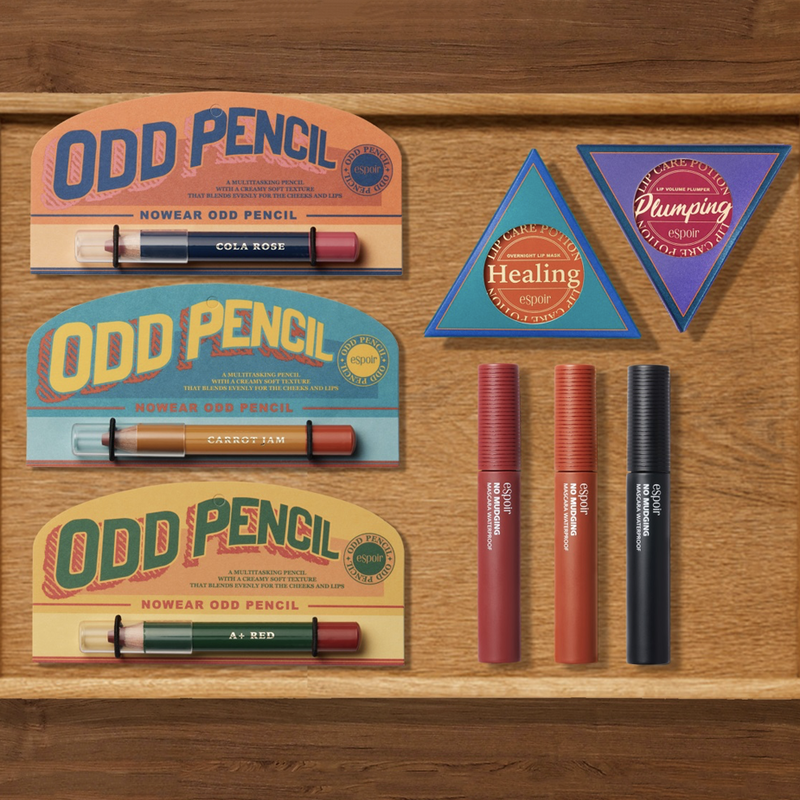 Befitting the collection dubbed “Odd Skool” evocative of the concept “school,” the brand adopted the idea of writing instruments. Simple and easy-to-pick-up products are designed to stimulate the sensibility of the Millennial consumers. “Nowear Odd Pencil,” the main product of the collection, is a wooden crayon with gold accent designed to give a vintage mood. The packaging design is also associated with vintage writing instruments. Instead of predictable square boxes, the packaging design incorporates unique and fun ideas from the use of string or triangular structures. Subdued colors or contrasts serve to accentuate the brand’s “oddness.” In addition, fur pouches used for promotion feature an unusual contrast of colors with gold accent, increasing the charm of the Odd Skool brand. You are more than welcome to the uniquely original world of Odd Skool by Espoir, which begs to differ!